The mass shooting in Las Vegas is just another example of avoidance and distraction. The gunman, Stephen Paddock, had over forty rifles. He had an arsenal sufficient to kill nearly sixty people and wound over five hundred. But it’s not the right time to talk about gun control. Well, I suppose that you could say that if a meteor landed on your head, “now would not be the right time to discuss gravity.” Unlike gun violence, being bopped upside the head by a meteor is not something that is man-made, and it does not require a man-made solution. 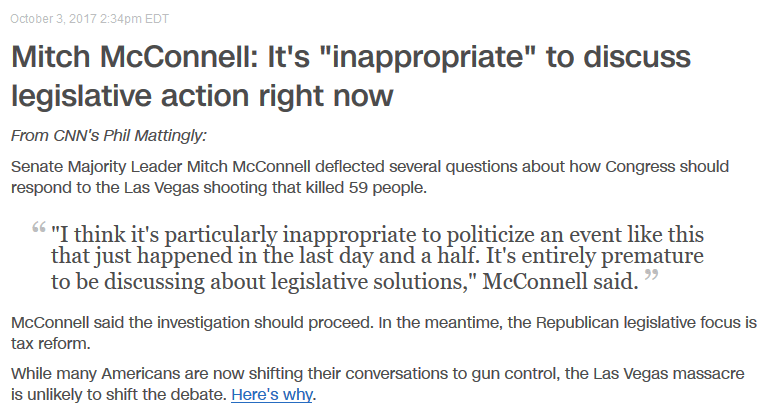 When, if ever, do Republicans think that it is the right time to talk about gun control? We all know that this is a specious question, because they never want to talk about. Whether we’re talking about Sandy Hook or the Pulse Nightclub shooting, or Las Vegas, it doesn’t matter. Now is not the time and there never will be a time. It’s not that different from their views on health care. The myriad of plans that Republicans had to repeal and replace the Affordable Care Act all seemed to be missing something. In a word, we’re talking about talking. Some people think that Senator John McCain’s reasons for opposing the latest versions in the Senate of repeal and replace were minimalist. He did not necessarily say that he opposed the policies presented by his Republican colleagues. Instead, he said that a process was not being followed, a process that involves study, dialogue, deliberations and conversation. He was saying to Mitch McConnell and others, “Now is the time to talk about health care.” That seemed to be too much for his Senate leadership to accept; after all, with health care, we were only talking about one-sixth of the entire American economy. Republicans are good at playing the news cycles. They know the drill. Something serious happens, the media comes in and covers it with varying degrees of serious consideration followed by what often is a maudlin aftermath. By then, we’re all worn out and ready to move on. And by then, Republicans can be confident that America does not have the appetite to give serious consideration to issues like gun control or health care. One of the things that we work with students on is “B.S. Detection.” Five-year-olds begin to get the hang of it; by the time that kids are ten, they have a good handle on it. But there seems to be a certain numbing and dumbing nature to much of our education system and Republicans definitely know how to capitalize on that. So, they can say, “now is not the time to …” and they get away with it because not enough of the public sees the B.S. in it. Shame on them; shame on us. Previous Post:Really, all we can do is fixate on a flag and an anthem?